Ghosts run deep in Newport. The town’s cobbly streets call back to colonial times and the grounds of the Newport Folk Festival, AD’s reason for being here, are situated around historic Fort Adams, which was built in 1824 and was at its time the most complex military fortification in the western hemisphere. Despite the Festival’s sprucing up of the place — huge golden banners with the show’s logo, the requisite Gibson Guitars bus — you never really shake the sense that you’re watching folk music from the foot of the Spanish-American War, which is a compliment. Fort Adams runs along the water’s edge at Brenton Cove, where yachters park their mini-ships and sails scrape the sky like steel in Manhattan. Combined with the spanning Claiborne Pell Bridge, it makes for a stunning view, particularly as the sun set today over a mud-caked Newport Folk Festival. New York’s, OurStage Newport winner, Sydney Wayser started the day on the Waterside Stage, dragging all of the overnight heat of a Brooklyn barroom into the morning sun, washing her real-gone voice in a bath of clanging bells, drooling organs, and claptrap percussion. The twenty-three year-old’s vocals — imagine Feist taking a few more risks — are probably better suited for the nighttime and everything after, but she was strong enough to overcome the obvious setbacks that come with an early set and easily won the crowd over. While the kids tore it up and teared up on the Waterside Stage, the Young @ Heart Chorus — a choral group comprised entirely of senior citizens aged seventy-two to eighty-eight who are best known for their renditions of Sonic Youth and David Bowie songs — were the early hit of Newport. I walked up near the end of the Talking Head’s “Heaven,” and the group immediately went into James Brown’s “I Got You (I Feel Good).” And while it was certainly nice to hear those two classic songs, the highlight was the Ramones’ “I Wanna Be Sedated;” it’s note every day that you get to see a gentleman sing the line “Put me in a wheelchair/I wanna be sedated” from the comfort of, um, his wheelchair. 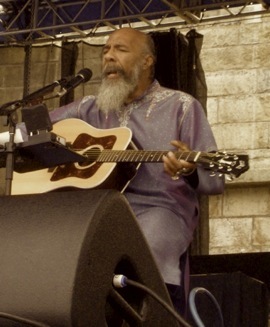 Richie Havens turned in a set of foot-thumping folk on the waterfront Fort Stage, accompanied by a lead guitarist and a cellist. Havens’ guitar style — think ferocious, barrel-roll strumming — is inimitable and just as strong today as it was forty years ago. And while his originals are certainly strong, it was his takes on “All Along the Watchtower” and “Maggie’s Farm” that made his set. “Maggie’s Farm” was particularly strong, with Havens shifting into a particularly mournful cover of the Who’s “Won’t Get Fooled Again” that found the secretly defeated attitude that undercuts Daltrey and Townshend’s furious original. A crowd began to form under the tent back at the Harbor by the time Steve Earle took the stage. Earle’s audience was one of the day’s more rapt; for the majority of his set, little could be heard but the scrape of his voice and his stunning guitar work. There may not be a more weathered man at Newport, or anywhere for that matter, and it was strange seeing music so tender come from a man so hardened by rough living. Along with his wife, the beautiful Allison Moorer, Earle brought along a DJ who ran drum loops, scratches, and samples that created an oddly pleasant backbeat. Earle’s slurry growl made his tough songs tougher, and the sad songs sadder, particularly on the moving “Sparkle and Shine,” a song for the cloud-voiced Moorer, who stood by proudly. The crowd back at the Harbor would have done well to wander over to the Waterfront at some point during Earle’s show, where American Babies (another OurStage Newport winner) were wrapping up their boot-stomping set of country rock. The Babies, led by singer Tom Hamilton, were easily Newport’s hidden gem, rollicking and bashing along on a clean jazz-stomp and sounding like recent Wilco rolling around on Strawberry Fields. Hamilton has great vocal range and sings in vein-popping earnest; his tight band popped and fuzzed and even found themselves called onto the Fort Stage to fill in for the delayed Marley Brothers. Rumors of a massive thunderstorm headed east from New York made their way through the crowd as She & Him began their much-anticipated set. The Harbor tent was packed far beyond capacity, with security eventually forcing people out of the aisles and into what quickly became a heavy downpour. The pounding of the drops on the tent’s vinyl roof added to the band’s warm atmosphere, though Zooey Deschanel contributed little beyond her vocals. 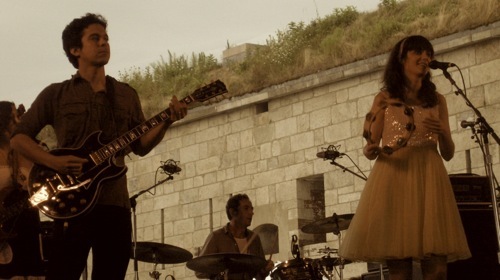 While M. Ward led the group over lush AM country roads, Deschanel seemed to be afraid to stretch her voice in any way, shying away from testing her considerable talent and staying instead in familiar territory. Perhaps it’s not fair to criticize Deschanel’s stage performance — she is primarily an actress, after all — but everything about her set, from the roses in her backup singer’s hair to the reverb on M. Ward’s guitar, felt so carefully arranged that she seemed to be afraid to take a step in any direction, lest she ruin anyone’s plans. Not surprisingly, longtime M. Ward cohort Jim James joined the group for a song, instantly raising the energy level in the tent. James’ appearance seemed to wake everyone up, if at least for a moment, with he and the now especially-timid Deschanel sharing a mic. Parts of James’ own solo set gave way to Evil Urges — a quiet “Sec Walkin’,” and a peaceful “Look at You,” among others — but it was Z’s “It Beats 4 U” that stole the show. While he fingerpicked a spiny melody and the rooftop rain slowed to a patter, James shouted out in a soulful lament, his voiced cloaked in his now-trademark reverb. For four minutes, no one spoke and no one moved: not the security detail, not the audience; it was one of those rare live moments when everything stands still and time arrests itself, and it’s these moments that James and My Morning Jacket seem to be creating more and more of; there is no better voice in music right now than that of Jim James. He tackled It Still Moves’ “Golden” with help from “Montgomery” Ward (as James re-introduced him), and later, backstage, confirmed that he and Ward, along with Conor Oberst, have just finished work on an album of original material and are in the process of finding a label. While Bob Dylan’s spirit still floats near the surface, Newport belongs to Jim James; as he made his way from the artists’ compound to the commissary, hired geeks (myself included) flocked from around the press area, some asking questions, but most wanting only a picture or an autograph or just to say hello. It was a rare moment that found JJ without an entourage at least three or four deep. With the mud creeping in and the stage seeming too removed from the crowd, the Felice Brothers opted instead to play on the ground, Simone Felice’s snare and hi-hat literally half-buried in a mud puddle and everyone else stomping around in bare feet and rolled jeans. The brothers (and their good friends Christmas and Farley) played a completely unplugged set that would have hearkened back to Newport’s early days were it not for the frenetic energy and the glorious slop of the entire affair. Simone routinely left his drums, stalking his way through the crowd and inciting everyone to sing along while the fantastically-bearded James Felice convinced half of the girls in the tent to dance with him as he squeezed the hell out of his accordion. Somewhere in the mud and confusion, Ian Felice broke three guitar strings and went hoarse, prompting the small but rabid crowd to shout back the words to “Frankie’s Gun! !” in what was one of the most invigorating performances of the day. By day’s end, though, I somehow found myself in the side-stage crow’s nest for the Black Crowes raucous headlining set, one that Chris Robinson opened by himself with a remarkable version of Dylan’s “Girl From the North Country.” As the sun began to set on the floating mansions in the Cove and the double-swirled guitars of Luther Dickinson and Rich Robinson pealed and whaled across the lawn — well, what’s not to like? We need bands like the Black Crowes; we need someone to keep rock’s shaggy spirit alive, if for no other reason than to remind us of what it sounds like to make music just for the pure joy of it. That’s the spirit that the Felice Brothers captured in their little tent on the water, and even though their music couldn’t be any more removed from that of the Crowes, they share that same sonic sense that good music matters and that it’s worth falling around in the mud for. I recorded performances by She & Him and Jim James. I’d be happy to share them with you and your readers if there’s any interest. Drop me a line and let me know. Great write-up. Wish I’d been there. Thanks. It was nice reading all about the festival, It gave me the feeling of how wonderful it was being there, I felt that experience just reading! Great writing! Hope to read more like this! Thankyou!